Here, graphene is represented by a maroon-colored top layer; boron nitride is represented by yellow-green lattices below the graphene; and the atom is represented by a grey circle. A low concentration of DC voltage (in blue) allows the light to propagate inside the boron nitride, forming a tightly confined waveguide for optical signals. 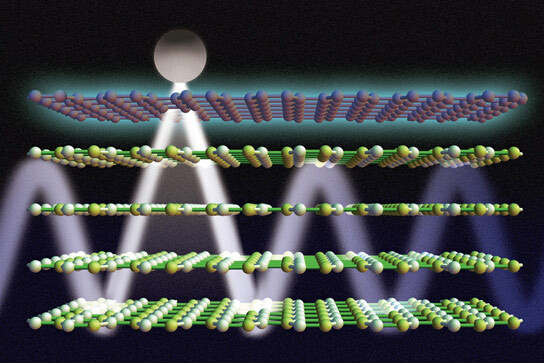 By applying a DC voltage to layers of graphene and boron nitride, researchers have demonstrated the ability to control light emission from a nearby atom. Be the first to comment on "Researchers Control Light Emission by Pairing Exotic 2D Materials"